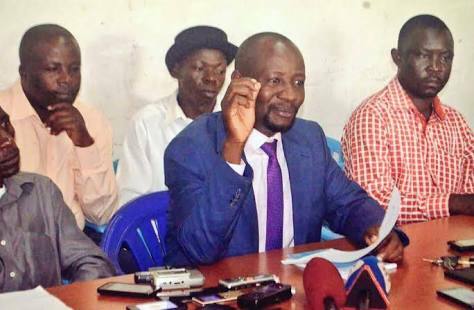 FDC spokesperson Ibrahim Ssemujju Nganda addresses journalists on Monday June 18. 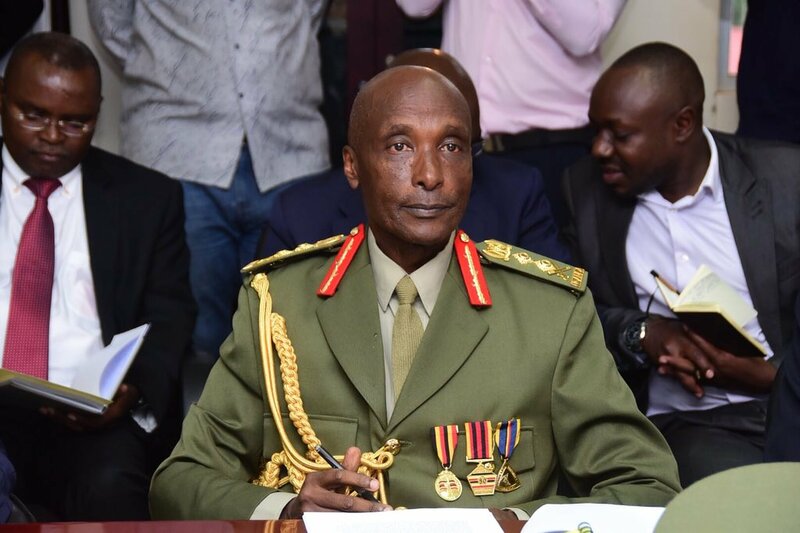 KAMPALA – As the country awaits the appearance of Gen Kale Kayihura in court, the Opposition Forum for Democratic Change party (FDC) have called on government to set up a court process that will see the former IGP account for his entire 13 years in office. While addressing journalists on Monday, June 18, FDC party spokesperson, also Kiira Municipality MP, Ibrahim Ssemujju Nganda, said the High Court should appoint a panel of three judges to try the general and his accomplices. Sacked on March 4, 2018, the former IGP was arrested last week on June 13, and has since been held at Makindye Military Police Headquarters where the army said he was being questioned on a number of issues. On Monday, media reports indicated that the 4-star general was set to appear before the General Court Martial in Makindye. However a communication later the same day, signed by Ms Angella Kayihura, refuted the claims that her husband was set to be tried. “To date neither Gen Kayihura, nor any member of his family have instructed any lawyer to file any application in any court, for any purpose. Statements to that effect are false and should be ignored,” Kayihura’s wife, Angella said. Mr Nganda on Monday said Gen Kayihura should answer for all the crimes he is liable for during his 13 years as IGP and not just those crimes which President Museveni feels he should be tried for. The MP also recommended a judicial commission of inquiry to probe the 13 years of police led by Gen Kayihura. He argued that many crimes were committed that needed investigation. He also called on President Museveni to take responsibility for Kayihura since the President always praised Kayihura even as he committed what the MP called atrocities against government critics. 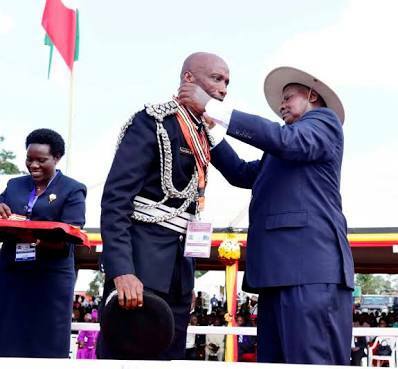 President Museveni decorates Gen Kayihura at a recent ceremony. The Opposition have asked the President to take responsibility for Kayihura’s criminality during his reign as IGP. Ms Kayihura’s statement issued Monday disaccosiated her husband and family from lawyers Evans Ochieng and Caleb Alaska who were earlier indicated to represent the troubled general. Ms Kayihura clarified that her husband would be represented by Kampala Associated Advocates. “This is to inform the general public that neither General Kale Kayihura nor any member of his family has met, talked to or instructed Mr. Evans Ochieng or Caleb Alaka or their law firms to represent General Kayihura, as prior alleged, “ Ms Kayihura’s statement reads in part. 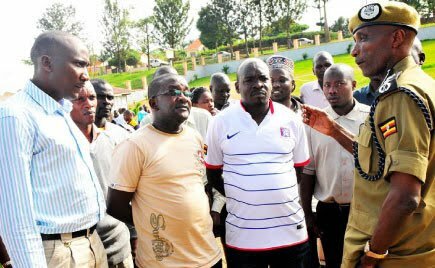 The arrest and pending trial of Gen Kayihura, a hitherto blue eyed boy of President Museveni, comes as one of his close allies, Boda Boda 2010 boss Abdallah Kitata’s, trial commenced recently. Kitata faces a number of crimes including illegal possession of a gun and military ware. Kitata and his bandit group of boda boda riders were notoriously known for helping police carry out what could well be stated to be crimes against members of the public especially those in Opposition during rallies and demonstrations. Pundits have also associated the former IGP Kayihura with the gruesome killing of former police spokesperson AIGP Andrew Felix Kaweesi in 2017.